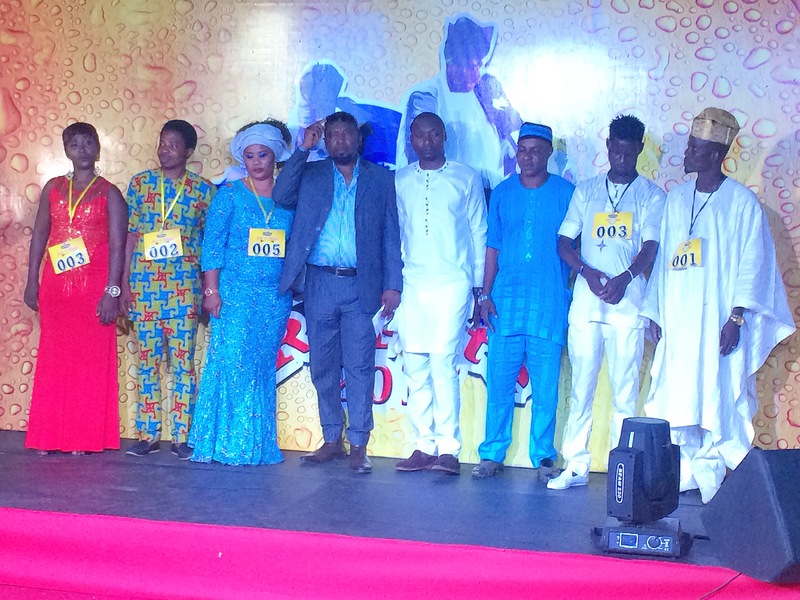 R-L: Bolomope Saheed, Olajide Muiz, selected Fuji artistes; Sikiru Ayinde; Adebayo Faleke and Wale Thompson; Panel of Judges; and Alhaja Bukky Ahmed, Muyiwa Ojo; Esther Iwelewa; all selected Juju artistes to the quarter finals of the ongoing Ariya Repete, a talent hunt competition for Fuji and Juju music organised by Goldberg on Friday, May 4, 2017 in Abeokuta, Ogun State. A total of ten contestants, five each from Osogbo and Abeokuta, have made it to the quarter finals in the ongoing Ariya Repete, a talent hunt competition for Fuji and Juju music in the South-West. The auditions that produced the winners were held in Osogbo and Abeokuta on May 3 and 5, 2017, respectively. In Oshogbo, three Fuji and two Juju artistes were selected while the reverse was the case in Abeokuta where three Juju and two Fuji contestants were chosen for the quarter final stage. The Fuji artistes selected in Osogbo are Jimoh Azeez, lsmail Eriki and Wasiu Onilewura, while those from the Juju category were Leye Williams and Oluseun Adebayo. Those that made it at the selection party in the Juju genre in from Abeokuta are Alhaja Bukola Ahmed, Mayowa Ojo and Esther Iwalewa while Bolomope Saheed and Olajide Muiz qualified from the Fuji genre. It was a night of fun as Antenna and Twinzobia, past Fuji t’o Bam winners and other artistes thrilled the audience with contemporary music from both genres. The judges also put up spectacular Juju and Fuji performances to the delight of guests. At the quarter finals slated for June 30th in Akure, winners from both cities will compete with others selected in Akure, Ibadan, Ilorin, Ijebu Ode, Ado Ekiti and Lagos. The semi-finals will take place on July 7th in Abeokuta with the grand finale scheduled for July 14th in Ibadan, Oyo State. In the quarter finals, artistes from the different locations would be reduced to 10 and this would be further pruned to five for the grand finale. At the grand finale, a winner, each for Fuji and Juju will emerge with each clinching a grand prize of One million Naira (N1, 000,000) and a recording deal. Commenting on the initiative, Portfolio Manager, Mainstream Lager and Stout brands, Emmanuel Agu, said “the brand is using Ariya Repete to extend its drive to discover new talents in the two indigenous Yoruba music genres and the move is in line with its commitment to promote the culture of the people of South West Nigeria. Robbers kill bank agent after been identified .